Japanese style iced coffee brewed over 24 hours. I like an excellent cup of coffee. Unfortunately, I've had to cut my intake down to practically zilch, because, well, it seems that too much coffee makes me itch. But, when it comes to Vertigo Coffee, I throw caution to the wind. It's a good thing I don't live in San Juan Bautista. 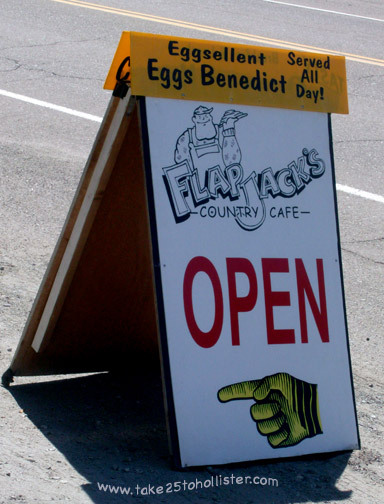 Flapjack's Country Cafe is in Tres Pinos, on the north side of Highway 25. You can't miss it. Honestly. The husband and I like to start an adventure with breakfast at Flapjack's. Or, when I can't stand it anymore and I need to eat me some pancakes. 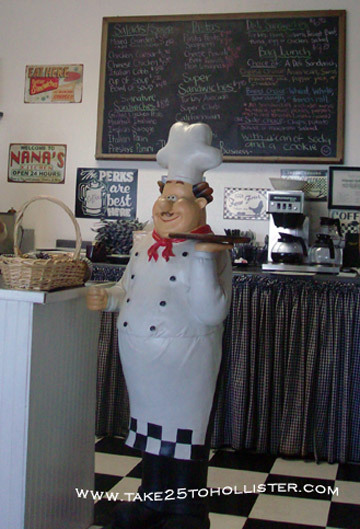 The restaurant is open Wednesday through Sunday, 7 a.m. to 3 p.m. If your heading to the San Benito County Fair this weekend, and looking for a place to eat beforehand. . . well, need I say more. The Burger Factory at 125 San Benito Street is almost (if not already) two years old. All I know is that Julie and Jin Hyun, the owners, opened it two autumns ago. Obviously, I like the food. My favorite keeps changing. Right now, it's the teriyaki bowl. Yummm. What I also like about the Burger Factory is the smiling and friendly manners of Julie and Jin. The livestock, the crafts, the fine arts, the performers, the carnival, the exhibits, the vendors. . . . Yep, it's that time of year again, folks. 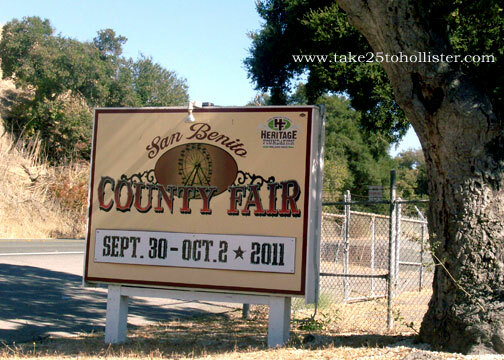 The San Benito County Fair starts this Friday (September 30) and ends on Sunday (October 2). I'm looking forward to it! Click here for a list of events. 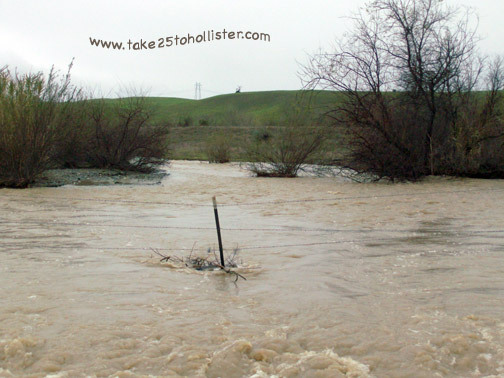 San Benito River on Southside Road, below Tres Pinos, in February. The San Benito River starts at San Benito Mountain, the highest peak in the Diablo range in our county. The river runs northwesterly, for about 109 miles, to its end at Chittenden Pass (southeast of San Juan Bautista). It used to be that kids would swim in the river during the hot summer days. Today, no visible water runs through it, except for during the rainy months. Here are some interesting pages about San Benito River to check out. 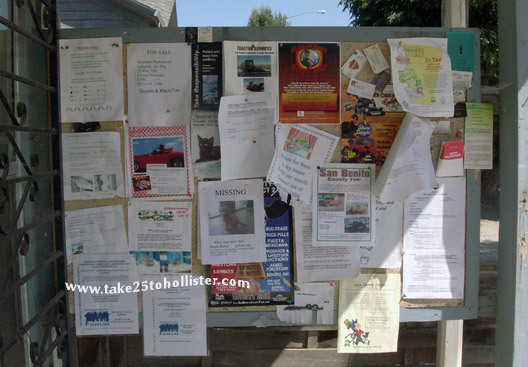 More specifically, I like the community bulletin board at the Tres Pinos post office. the local place to buy local products! 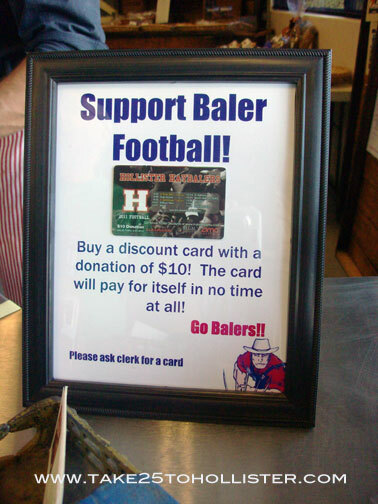 And, you know what, you can now go to this one shop in Hollister to buy these products and other local goods, Monday through Friday. San Benito Bene is the place! Today, Saturday, San Benito Bene continues its grand opening, starting at noon. You'll have a chance to taste some of the local foods that are available in the shop. Check it out, if you can. 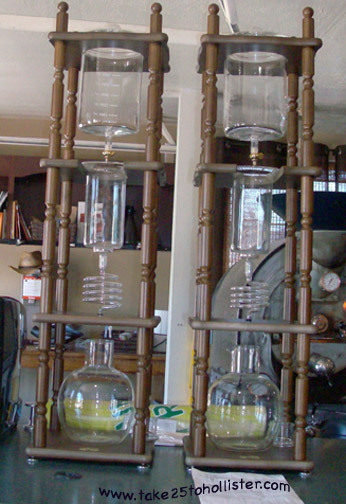 The shop is located at 615 San Benito Street, the same side of the block as Heavenly Bakery and Best of Times Cafe. Christmas shopping is going to be so easy for me this year. 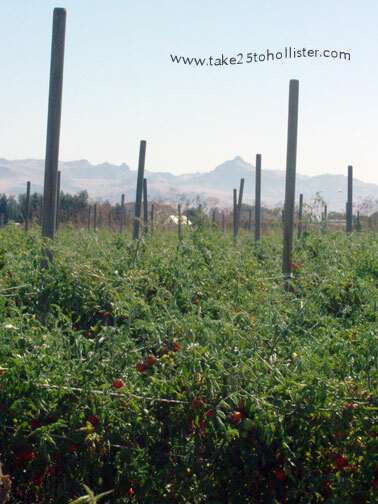 Yesterday, the husband and I picked organic tomatoes at the Mariquita Farm in the northern part of San Benito County. Nearly 30 pounds of red and green bursts of nutrition and flavor. If you're interested in getting in your own supply of tomato goodness, there will be another U-pick day tomorrow, Saturday, September 24, from 9 a.m. to noon. They'll have other vegetables on sale as well. Here's a link for more details. East side, west side. I like both sides of the Pinnacles National Monument. How can you not? You know it was once part of a volcano located in Southern California. Seriously. This Saturday, entry into this national monument will be free, because it's National Public Lands Day. As part of the day's activities, the rangers will be releasing two California Condors. 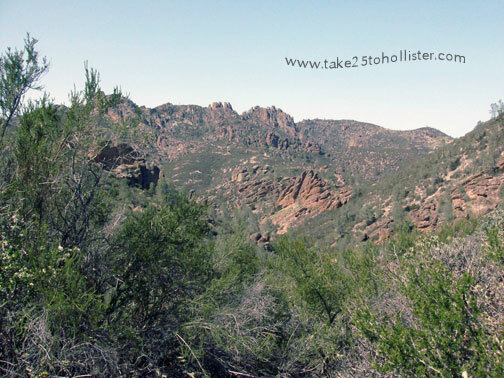 For more info, head over to here, the Pinnacles National Monument Web site. A couple weeks, the husband and I strolled up and down San Juan Bautista's main street with a couple of friends looking at store windows. We, well okay, the women, even wandered into the stores. I can't recall to which store this window display belongs. But, it's easy to find again. 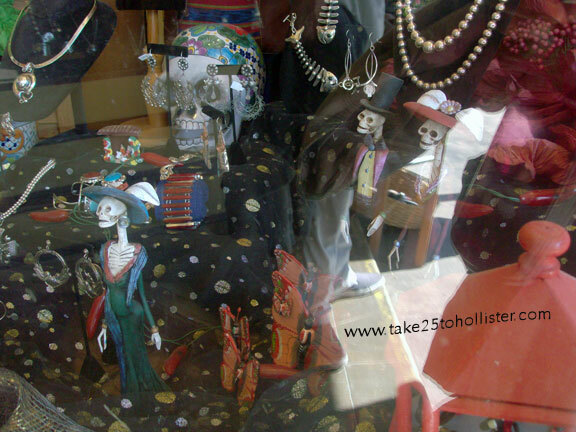 Check out this link, if you'd like to see a list of shops in San Juan Bautista. I did not realize how much I missed the open skies of Hollister until the husband and I moved here eight summers ago. 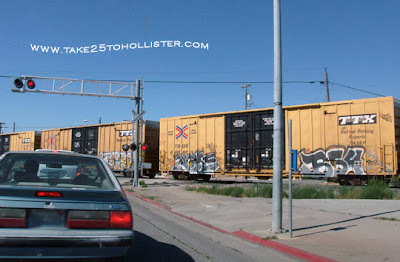 I was born and raised in Hollister and moved up to San Francisco for college. I visited my family often in the 30 years I lived up in the Bay Area, but always ready to head back to what was home. Honestly, I never thought I'd be back in Hollister. Now that I am, well, I'll just say this: I need and want the open skies. I love it when the mustard is in bloom. Don't you? I took this photo of the husband pedaling through this particular field a couple late winters ago. Lately, that means a bicycle ride to Bertuccio's Produce Stand. There, the husband and I can get a dozen of fresh eggs "donated" by local chickens. 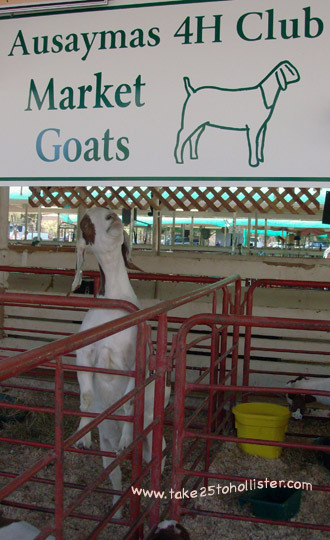 We also like to go there for nuts and jams, all locally produced. Sometimes we find great produce bargains; for instance, once time, we got avocados for 50 cents each. And, every now and then, they have a basket of free produce that are still good, but not good enough to be sold. Totally like that. Bertuccio's Produce Stand is just before you reach the corner of Highway 25 (Airline Highway) and Union Road, as you're heading south on 25. 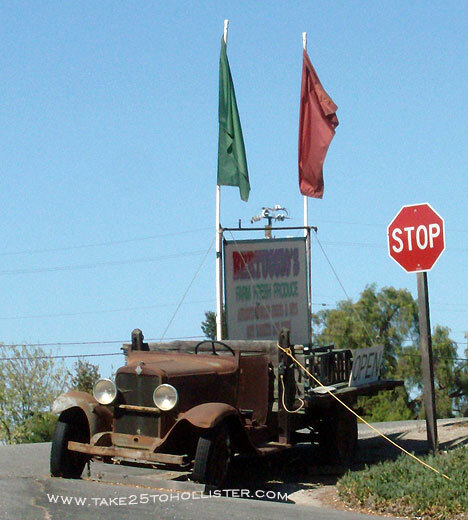 That cool old truck marks the spot where you'll be turning right onto Bertuccio's driveway. How much do I like Victoria's Deli? Well, there are at least six places within a mile where I can get take-out deli stuff. But, when I get a craving for Victoria's basil pesto, I drive all the way across town and almost to the airport to Victoria's Deli. Their sandwiches are yummy-licious, too. The mama, who is a picky eater, does not pick when it comes to eating her favorite ham and turkey sandwich. Yesterday, she discovered the Boston clam chowder and the husband chowed down on a chicken pesto sandwich. We were all three happy campers. It's September. It's harvest time. Give thanks! to all the workers who are out there picking and gathering the vegetables and fruits for our bellies. There is nothing easy about their jobs. To get this photo, I leaned out the car window and snapped away as the husband drove east on Highway 156 through San Juan Valley. 100 Things I Like: Toot! Toot! The Union Pacific freight train rolls into Hollister. Unless I'm running late, I don't mind getting stuck waiting for trains to rumble through. Not like it's a regular thing anyway, or the train is very long. There's nothing like the "Hey! I'm here!" sound of a train whistle. 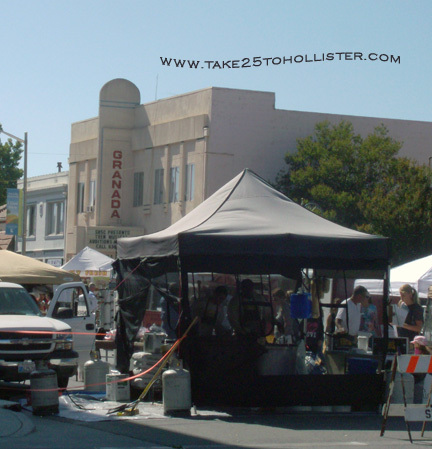 Today is Farmers Market Day in Downtown Hollister, from 3 to 7 p.m on Fifth Street. Only three more market days left until next year. Yes, I know this isn't the most flattering shot of the market. I just like the way the Granada Theater sign sticks up above the canopies. The prickly pears are in bloom again. Imagine Katherine Hepburn saying that as she tenderly holds a bouquet of prickly pears instead of calla lilies in the movie Stage Door. I'm not so keen on eating the fruit or the pads. For me, the appeal of this plant is its look. It makes my imagination run rampant. 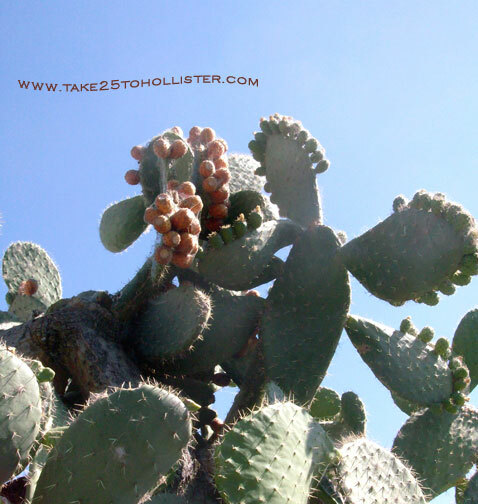 By the way, if your curious about the prickly pear plant, check out this page at the UC Small Farm Program Web site. 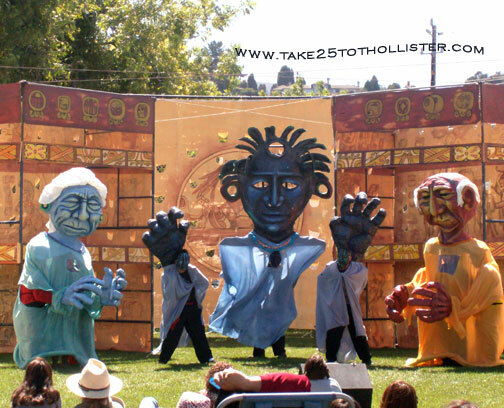 Our small, yet vibrant, rural San Benito County has richness of culture—as in art, music, and theater. The renown El Teatro Campesiño, for example, run by Luis Valdez, makes its home in San Juan Bautista. This past summer, the theater group had been performing its Popul Vuh trilogy, of which the first and second parts were performed free in the Mission City. Thank you El Teatro! 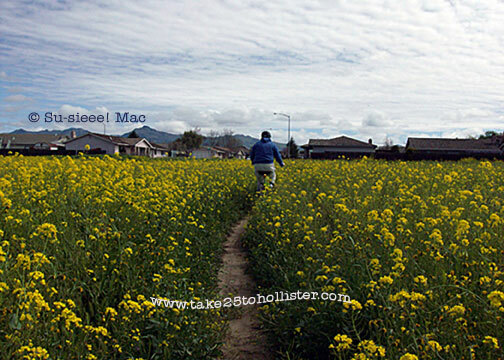 Note: Click here if you'd like to see the other 100 Things I Like About Living in Hollister. Uhm, you should know that I just began yesterday. Today is day 231 in my quest to post a daily photo for one year. So, I think it's time for me to start my list of 100 things that I like about living in Hollister. They aren't in any particular order and I might not do this feature every day. Just so you know. 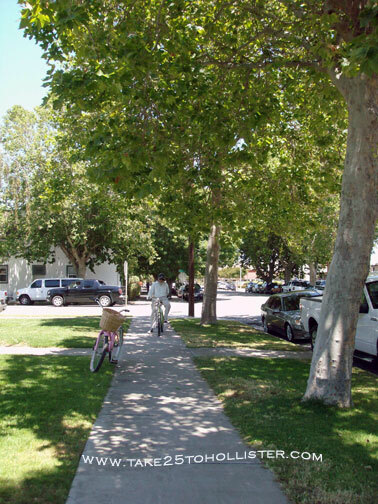 But, today: One of the things that I like about living in Hollister are the trees on Monterey Street. By the way, we don't ride our bicycles on the sidewalk. The husband is just patiently waiting for me to finish the click-with-the-camera thing. Double click on the photo for a larger view. Leaning out the car window, I very quickly clicked a photo of the hillside at the northwest entry (or exit) to Tres Pinos. 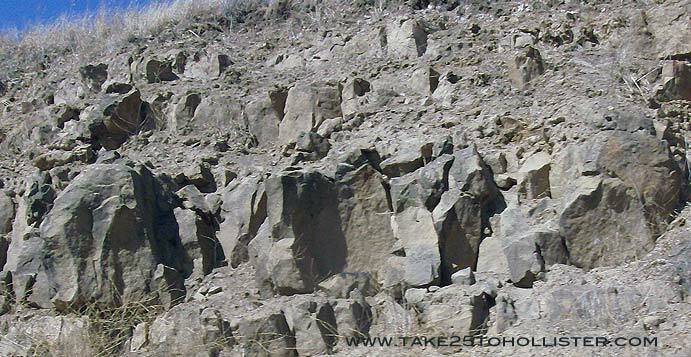 This outcrop of rocks fascinates me for no good reason. Look closely and you can see a bunch of figures and faces. Remember Medusa? It was a good thing no one was behind us when I requested the husband to stop suddenly just as he turned onto Prescott Road from whatever road we were on as we wandered through San Juan Valley. 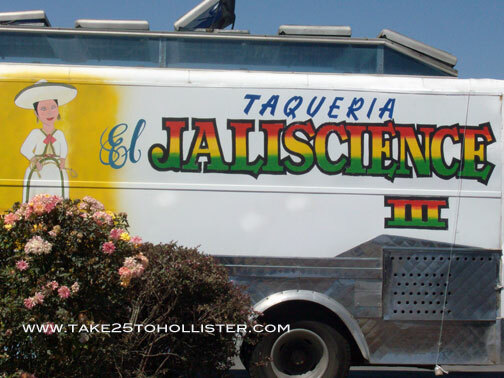 The taco truck was too cute not to take a photo of it. 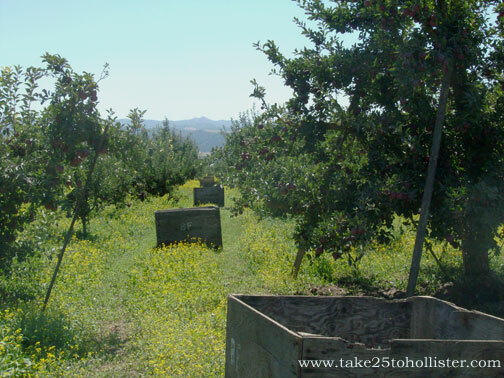 The other day I posted a photo of an apple orchard in San Juan Valley. Across from it was this onion field, the crop already harvested. For whatever reasons, these onions didn't make the truck. 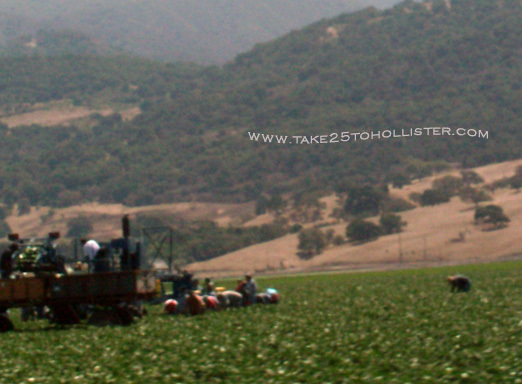 Agriculture is the number one industry in San Benito County. According to the 2010 Annual Crop Report of San Benito County, 23,793 tons of bulb onions were produced in 2010, which valued nearly $6.7 million. 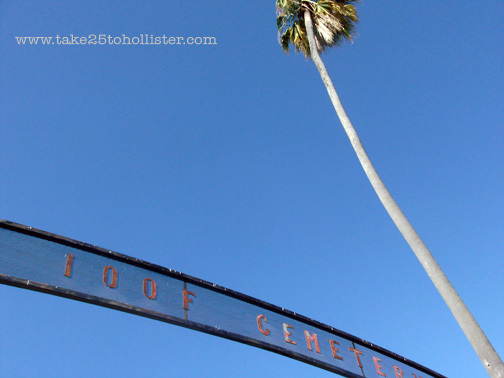 Are you like me, and you find out about events after the fact, especially in Hollister and San Benito County? Or, you learned about happenings to be several weeks before the date, only to forget when the day arrives? 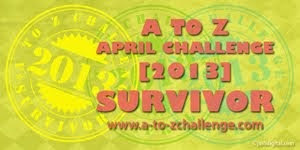 This Web site is also a free e-newsletter that suggests activities for families to do together. It is edited and published by local Valerie Silva, who has been at it since May 2010. Being a mom, she says her mission is "for families to engage in quality time together, whether it be outside the home with events listed in the newsletter, or by enjoying crafts, cooking and other projects that might be listed in that week's posting." Valerie posts every week, usually on Thursday. She invites both organizations and individuals to post their events and activities on Hollister Macaroni Kid. Businesses are also welcome to advertise at her site as well. Currently, Hollister Macaroni Kid has over 5200 views per month. It is is also on Facebook and Twitter. You can contact Valerie at valeries at macaronikid dot com. One again, that's Hollister Macaroni Kid at www.hollister.macaronikid.com. Disclosure: Valerie asked me if I would post something about Hollister Macaroni Kid. I was very glad to write about her Web site since I've used it as a source for some of of my past posts, which was way before she contacted me. So, to FCC and anyone else who cares, I did not receive any money, gifts, or threats to write this post. These tiny, delicate blue flowers are growing happily out of the sidewalk. 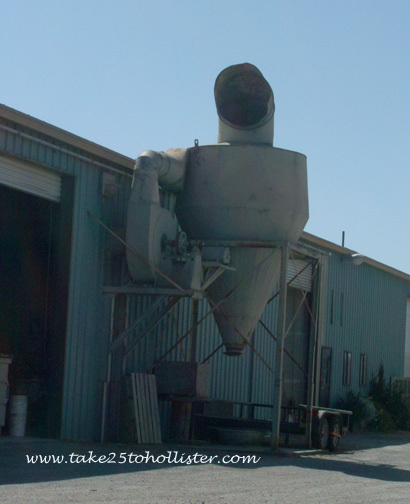 I came across them as I was walking along San Benito Street in downtown Hollister. You know that saying "slipping through the cracks." 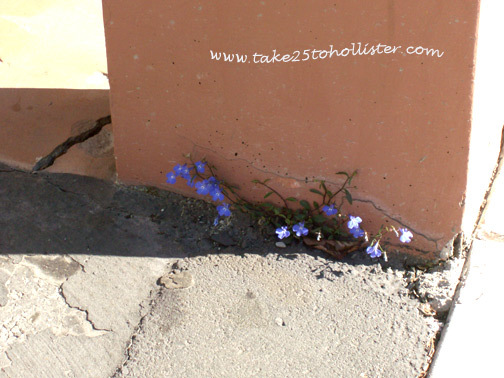 The flowers are a great example of the desire and persistence to grow throw the cracks. By the way, today is the 225th day of my posting a daily photo for a year. 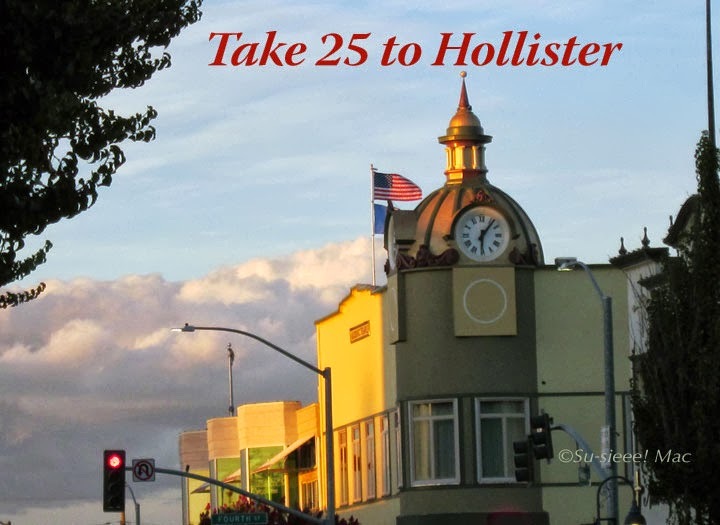 It's also the third anniversary of Take 25 to Hollister. Here's the link to my first post. This is the field across from the Catholic church in Tres Pinos, just off Highway 25. It's the field in which skydivers land on the west end and hang gliders take flight on the east end. The landscape looks just as wonderful from the sky as it does from the road. I took the above photo around 5 p.m. last Friday. This image is untouched. So either I have a dusty lens or it was rather smoggy that day. It could be a combination of both. Now, see how the image looks when I did some adjusting of brightness, contrast, and color in Photoshop. My question is this: Which image shows the scene as it really is—the top, middle, or bottom photo? 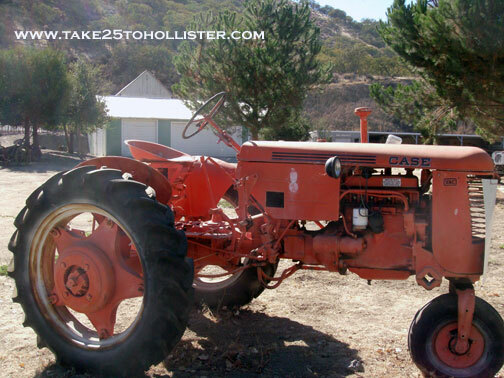 The orange tractor really is for sale. You can see it at the San Benito County Historical and Recreational Park, a mile or so south of Tres Pinos, on Highway 25. While you're there, take a look at all the other historical buildings and things that were relocated from other parts of the county.